People with knowledge of the noose incidents said tensions have risen at the Sterling Heights plant since headcount ballooned to more than 7,000 hourly workers, from about 3,000. 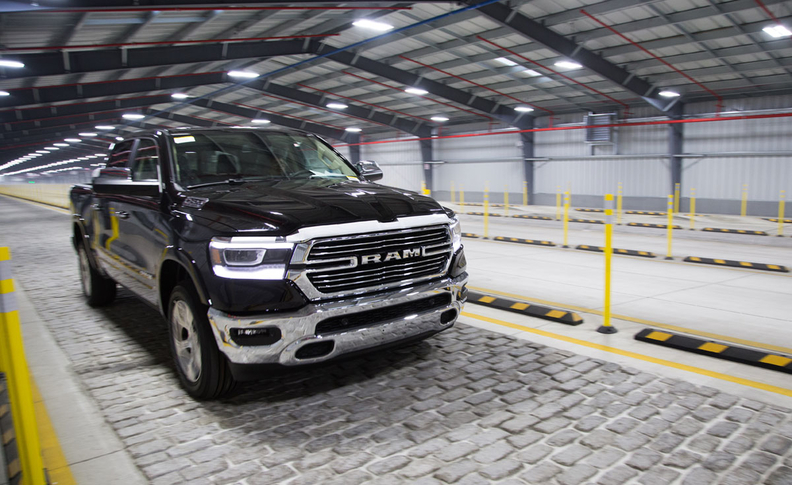 The photo from January shows a 2019 Ram going through the Sterling Heights plant's "buzz, squeak and rattle" track. Fiat Chrysler workers discovered a noose hanging in a Ram truck plant in Michigan late last month, prompting a second investigation into racism at a factory already simmering with tension. The company brought outside investigators into its Sterling Heights assembly plant to look into who hung the noose, commonly understood to be a threat of violence against African Americans, but hasn’t found the culprit. It’s the second internal investigation into racist harassment at the assembly plant north of Detroit since late 2017, according to people with knowledge of the events, and the latest in a series of racist incidents alleged at U.S. auto plants. At a UAW convention in Detroit last week, union members passed a set of resolutions that acknowledged “much more work to do” to secure protections against discrimination in the workplace. “A rise in recent years of incidents targeting people based on their race, gender, immigration status, or religious beliefs is impossible to ignore and requires an aggressive response,” the resolution stated. General Motors faces allegations of racial harassment at a plant in Toledo, Ohio, while Ford has settled claims at a Chicago factory. Fiat Chrysler workers at the Sterling Heights facility first reported ropes that looked like nooses hanging in the factory in late 2017, as the automaker started preparations for its new pickup, according to people familiar with the events, who asked not to be identified because they weren’t authorized to speak. The company investigated and determined there was no malicious or racist intent, but together with the UAW agreed that workers wouldn’t leave knotted ropes hanging to avoid any further offense or misunderstanding. Workers reported finding another noose between 1 a.m. and 3:30 a.m. local time on Feb. 22 in the paint shop at the Sterling Heights assembly plant, commonly called SHAP. The next day, on a Facebook page for UAW Local 1700, which represents workers at the factory, an anonymous post was shared alluding to “several disturbing incidents” at the plant in the last few months, including one as recently as that week. The people with knowledge of the noose incidents said tensions have risen at the Sterling Heights plant since headcount ballooned to more than 7,000 hourly workers, from about 3,000, after the company overhauled the factory to make pickups instead of Chrysler and Dodge sedans. A large portion of the new workers were transfers from a nearby Fiat Chrysler facility in Warren, Mich.. This influx has triggered conflicts over job placements and seniority, the people said. A separate noose incident took place at another Fiat Chrysler factory last year. A subcontractor fired one of its employees at the automaker’s Toledo Jeep plant in June for hanging one, a Fiat Chrysler spokeswoman said, confirming an earlier report by The Toledo Blade newspaper.